Melloy Dodge: Should I Buy Automatic, Manual or CVT? Should I Buy Automatic, Manual or CVT? Shopping for a car is an exciting experience when you have so many options available to you! Most cars will get you where you need to go, but depending on what you’re looking for, your lifestyle, and your personal taste, not every car will be right for you. At Melloy Dodge, we have many great options that will suit you, but to help you narrow down your choices, here’s a look at the different types of transmissions that are available. Automatic. Perhaps the most common transmission now, automatic offers convenience and ease of driving. An automatic transmission changes gears without needing any input from the driver, it’s done electronically or hydraulically, the vehicle monitors speed and the engine’s rpm to automatically shift gears while driving. Automatic vehicle’s transmissions are nearly impossible to stall, and typically they need less maintenance than their manual counterparts. Six-speed and eight-speed automatic vehicles are very common. More gears mean quieter driving on the highway, superior acceleration, and better fuel economy. Manual. Commonly known as stick-shift, manual transmission requires the driver to manually shift gears with a clutch. Unlike an automatic with two pedals, a manual vehicle has three pedals. The third pedal, located to the left of the brake, is used when the driver changes gears. Driving a stick shift is a skill that takes a little bit of time to learn, but it is much simpler than it sounds. Driving a stick shift as opposed to an automatic can also result in better gas mileage and more power when you need it. Continuously Variable Transmission (CVT). 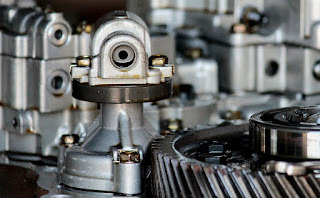 Continuously Variable Transmission is a type of automatic transmission that uses pulleys instead of fixed gears. CVTs are relatively less expensive to build than conventional automatic or manual transmissions because they require fewer parts. Acceleration is limited, so wasted power is minimized. Most small cars on the market utilize a CVT, and it is expected that this transmission will likely become more popular. So which is right for you? The answer depends on your driving style and the type of vehicle you’re looking for. If you consider yourself a car enthusiast and want something engaging to drive, you may prefer a manual transmission. If you have a commute that consists of stop-and-go-driving, you may need an automatic or CVT. At Melloy Dodge, we have a variety of new Dodge and RAMs, as well as a large selection of newer used vehicles. Whatever your driving style or vehicle preference, we can show you some great options, and offer you a great deal!